This tortoise grows to between 12 and 17 inches in length. Males are slightly larger than females and have longer, wider tails. The thick, heavy shell is part of the skeleton and is made up of about 60 bones covered by plates called scutes. The skin and carapace, or upper shell, is dark grayish-brown with lighter patches on the scutes. The plastron, or bottom shell, is a yellowish-brown, sometimes slightly red. Sexes can be distinguished by the shape of the plastron, which is concave in males and flat in females. Limbs, head and tail are dark grayish-brown. This type of tortoise has a much lighter appearance as a juvenile. Commonly found in relatively dry grassland and forest areas, as well as the underbrush of tropical and humid forests. Inhabit the Guianas, Venezuela, Brazil, Ecuador, Paraguay and several Caribbean Islands. Primarily herbivorous, consuming a wide variety of grasses, fallen fruits, flowers, leaves, and occasionally carrion. Reach sexual maturity after 5 years. The mating ritual of the red-footed tortoise involves very distinctive head movements and clucking sounds by the male. The clucks sound amazingly like a hen, and can rise and fall in pitch. Females lay clutches of between 5-15 eggs, which are generally buried in a ground nest and incubated for 4 months. Usually 3 to 5 young will hatch. Females are not known to defend or guard their nests and show virtually no maternal instinct. In its range, the biggest threat to the survival of the red-footed tortoise is overhunting by man. Low reproductive rates and slow maturity also make it difficult for this species to recover from habitat loss. Another problem is exportation for the exotic pet trade, and the species is currently listed on CITES II. Red-footed tortoises are a medium-sized species and get their name from the red or orange scales visible on their limbs, head and tail. Also called Red-leg or Savanna Tortoise, they are found in tropical forests as well as grasslands and dry forests in South America. Tortoises have been around for millions of years and are land-dwellers. They do not have webbed feet, but round, club-shaped feet for walking and burrowing. Many individuals have a distinctive constriction in the sides of their shells, giving the appearance of a waist. 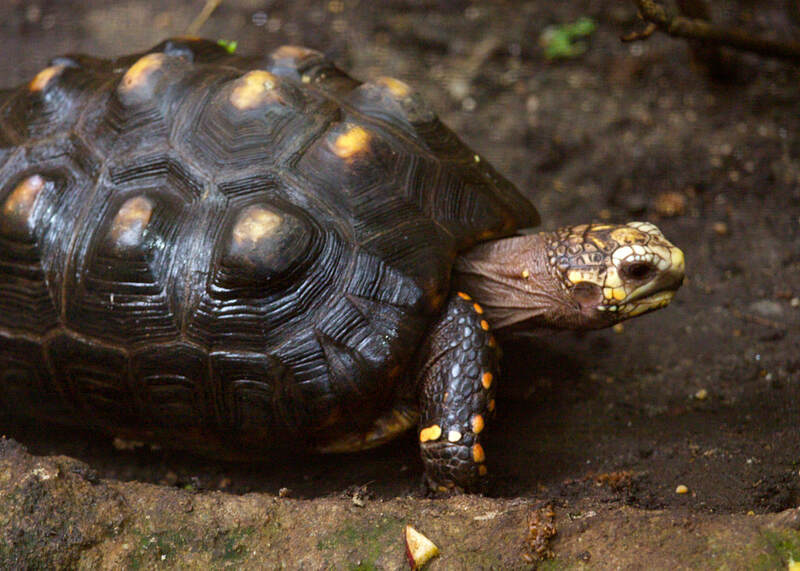 This is more pronounced in male red-footed tortoises. At Connecticut’s Beardsley Zoo, five can be seen in the Rainforest Building in the same exhibit with the Golden Lion Tamarins.